Shawn Bolz traffics in lies for a living. Whether they are willful on his part or he is so compromised demonically that he cannot tell is irrelevant to us. Maybe he believes he is hearing directly and audibly from God and just understands the Bible so little that he cannot tell it is demons that are feeding him. Then there are those moments on film where we see him scamming people by using a smart phone to do cold readings and we conclude that at least part of his "ministry" is clearly willful and purposeful deception. We should expect as much coming from one of the greatest demonic cesspools of a church in this world today -- Bethel. Bill Johnson's church is ground zero for the teachings of the NAR, false signs and lying wonders, and experiential Christianity. The Bible? That's for those other suckers who do not have God tapped next to them like a keg from their old college days. Bolz, like the whole crew and Bethel, believes he can teach the gifts of the Holy Spirit to people! The deception is very thick and very dangerous as they specialize in scratching itching ears. Shawn Bolz fancies himself a prophet-dude. Besides Bethel he is widely known through the Kansas City prophets as well. His prophecies are usually the same drivel about needing more of you as opposed to God. Besides being utterly clueless about actual prophecy, Bolz is equally ignorant about the subject of healing. This is again not surprising since Bethel firmly believes in mandatory healing. This is the false belief that God must always heal us, thus robbing God of His sovereignty. Bolz "prophesied" about a "season of healing" this week (linked above) that highlights how dangerous, unbiblical and cruel his mendacity can be. Let us reason together once more beloved. Needless to say, God is releasing no such thing. There is no "answerable prayer of David" as Bolz invents here. What he is referring to are the key verses from today. Most biblical scholars agree that Psalm 30 was a Psalm written for the dedication of the temple. It is a short twelve verse psalm where David is thanking the Lord for the various blessings and deliverances He has provided for him. Those who have read the portions of the Bible that detail David's life know that while he is a central and great biblical figure, he was also a flawed and sinful man. A murderer actually. A man of bloodshed and war. In the end David knows however that it is God who has sustained him and delivered him and this is one of many Psalms of thanksgiving. In it he recognizes that God could have wiped him out in His righteous anger. Yet God is good and merciful and spared David and even blessed him throughout his life. Pop quiz -- what does this Psalm have to do with your life? Answer -- absolutely nothing. We of course can learn about the various facets of God from this Psalm. The largest takeaway for me is the need to be thankful. To never forget the source of your blessings. To never forget that God may relent from destroying you but that does not remove His ability to do so. A reverent awe or fear is what we should take away from reading Psalm 30. This is not however what false prophet Shawn Bolz gleans from this text. To Shawn, verses 2 and 3 are an "answerable prayer" for people who find themselves battling a life threatening or debilitating illness. What does that hyper-spiritual gobbledygook actually mean? What Shawn is peddling here is that because King David once uttered this prayer to God over 3000 years ago and saw God heal him that it can now be applied to you as well. Yeah, that is not how the Bible works Shawn. Oh so now everyone facing surgery is included in this deal? This is one of the hallmarks of false prophecy today. It is a prophetic "onesie." Everyone who happens to be listening to his voice will all have the same prophecy applied to them? Every single surgery is going to result positively? Every single case of cancer will be cured? Why? 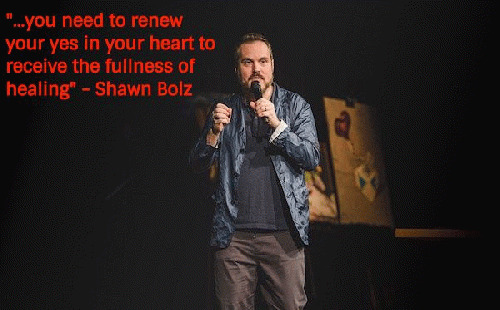 Because Shawn Bolz has created the theology of renewing the "yes in your heart" to receive the fullness of healing? What the heck is that even supposed to mean? It sure sounds spiritual but it sure isn't biblical. Please note that what he is clearly inferring is that everyone who has faced a long term sickness has done so by their own choice. Read it again. The fullness of healing is always available according to these hucksters but sometimes we can forget to activate the yes in our heart to receive it. What sickening garbage this is. Beloved hear me very clearly. God can heal you. God is sovereign and omnipotent. The spiritual truth however of who you are is not tied to the physical body in this mortal life. You must understand that for Shawn Bolz and the Bethelites, this life is all they care about. It is the idol that they worship. So yes the issues you are facing in your body are not your spiritual truth. They may however, be your physical truth. We all die beloved. Some earlier than others. I do not know why kids get cancer or loved ones leave us too soon. My faith does not require my full understanding of temporal events just a firm understanding of who God is. The Bible is filled with examples of unhealed believers. Many believe the thorn is Paul's flesh was a physical sickness of some form. He pleaded with God three times to take it away and every time God said no. do you think Paul just forgot to "renew the yes in his heart?" That is ridiculous. God did not heal Timothy's stomach ailments either. Other people were healed simply by passing under the shadow of Peter. No one knows why some were healed and some were not but I am pretty sure that it wasn't because of the lack of renewal of the yes in their heart.